While the public hotspot makes it easy for us to get online anywhere, but when we’re out of range, it’s not possible for us to connect to the internet. Microsoft has recently updated their operating system with a new feature that would allow you to turn your Windows 10 PC into a Wi-Fi hotspot. With Microsoft’s entrance into the cellular PC, Microsoft is turning the PC into a mobile device. History proves that mobility and Microsoft did not overlap very well. The company’s late entry into the cloud and mobile make themselves suffer. Microsoft learned its lesson, and they will be a fool if they don’t prepare themselves for the next wave of computing. With its deprecation of Windows 10 mobile, the company’s most mobile effort went into the iOS and Android platform. The original idea of Windows 8 was to make the desktop more like a mobile-looking OS. Although it was not an easy task to turn a legacy operating system into a Mobile OS. The efforts are still relevant and we have seen plenty of them coming to Windows 10. Efforts from both Qualcomm and Microsoft were fruitful in cracking the ARM technology with Windows 10. It is quite clear that a post PC world is knocking at the door. Whether it meets the same success as mobile, the time is not ready to predict that. In a smartphone dominating tech world, it will be an interesting shift if it ever happens. 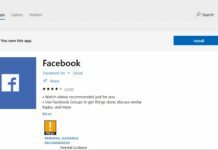 Microsoft is slowly taking all the necessary mobile stacks into Windows 10, with the exact same look and feel as it was in mobile. Believe it or not, cellular PCs are the future and it will replace traditional desktop PCs except for some hard-core gaming or power usage. 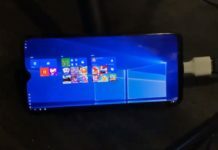 The all-new Always Connected PCs comes with eSIM technology, and the new Windows 10 update allows you to use the eSIM technology to create a Wi-Fi hotspot. Press Windows key+I, it will take you to the settings app then search look for network and Internet. In the network and internet section, Mobile hotspot option will be visible in the left section. Click on Mobile Hotspot. 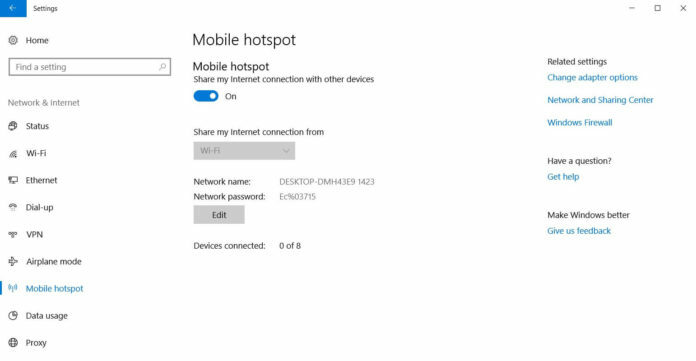 In the mobile hotspot, setting look for “share my internet connection from.” Click on it and select Wifi. Enable “Share my internet connection with other devices”. The Redmond giant is slowly taking the baby steps towards the mobile PC. Microsoft was first to take steps towards mobile PC. Over time Apple and Google also made their way. It is interesting to note that three of the technology giants have a crisis in terms of market share. Microsoft in mobile, Apple and Google in Desktop Computer. Three of them are working towards the same goal but with their respective strengths. It will be hard to pick a winner this early. But is it is safe to say that Microsoft made all necessary stuff in order to conquer ARM with Windows 10 and it looks like they are definitely ahead of Apple and Google.